Two men loading crates of celery either onto rail car. 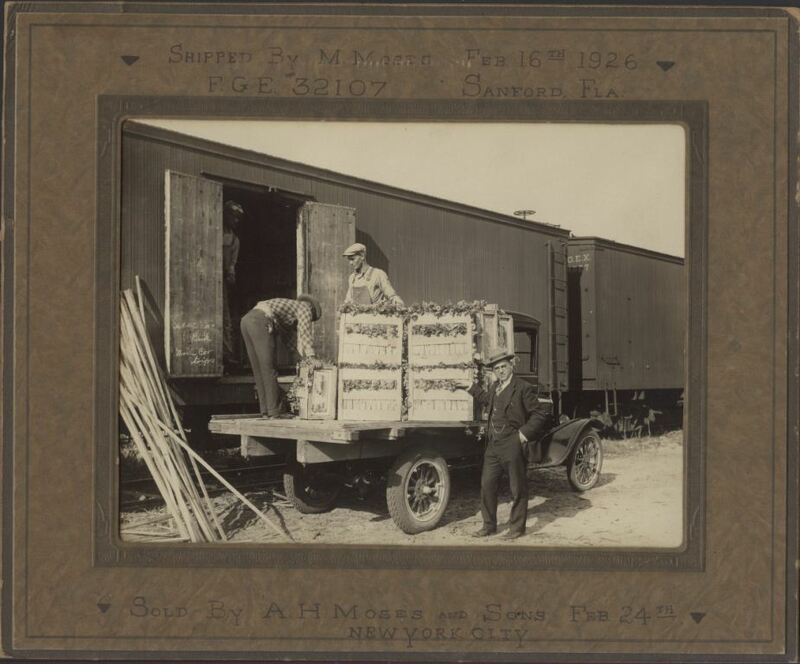 The celery was shipped by M. Moses, who also leased two stalls at the first Sanford State Farmers' Market, on February 16, 1926, from Sanford, Florida. A. H. Moses & Son sold the celery upon the shipment arrival in New York City on February 24. The man pictured in the dark suit is likely one of the Moses brothers. Sold by A. H. Moses and Sons Feb. 24th, New York City. Original framed black and white photograph: "Celery Shipment Loaded on Railcar." 1926. Sanford Museum, Sanford, Florida. Digital reproduction of original framed black and white photograph: "Celery Shipment Loaded on Railcar." 1926. Sanford Museum. Tag number DP0010677. Central Florida Memory. http://digital.library.ucf.edu/cdm/ref/collection/CFM/id/123589. Digital reproduction of original framed black and white photograph: "Celery Shipment Loaded on Railcar." 1926. Sanford Collection, Seminole County Collection,RICHES of Central Florida. Sanford: Our First 125 Years, page 52. Sanford Historical Society (Fla.). Sanford. Charleston, SC: Arcadia, 2003. ISBN 978-0-7385-1542-7. Mills, Jerry W., and F. Blair Reeves. A Chronology of the Development of the City of Sanford, Florida: With Major Emphasis on Early Growth. S.l: s.n. ], 1975. Carlson, Charlie. When Celery Was King. Sanford, Fla: Sanford Historical Society, 2000. 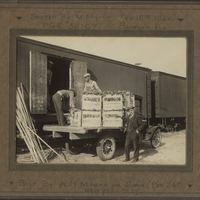 “Celery Shipment Loaded on Railcar.” RICHES of Central Florida accessed April 21, 2019, https://richesmi.cah.ucf.edu/omeka/items/show/3024.